Ainsley and I are Wisconsin Scotties. Bred & Born in Janesville, Wisconsin behind the cheddar curtain. Our hooman staff, though, are Southerners. Well, Mama was born in Indiana, but raised in Georgia, and Catman born and raised in Georgia. But they’ve lived up here with us Yankees for the past 25 years. They don’t have many Southern characteristics that they have retained – except maybe their accents. But one Southern dish they will eat is grits. And quite frankly, though I’m a Yankee Scottie, I like the grits myself too. I never do the ol’ sniff and sneer at Mama’s grits! Mama doesn’t try to make them from scratch. My late great hooman grandmama did – and boy, were they good! Mama makes the instant kind, and they are pretty good. And let me give you guys a cooking tip. Go easy on the water. You don’t need nearly as much water in the bowl as they say. Last thing you want is watery grits. And you don’t need anything in there – except maybe butter. 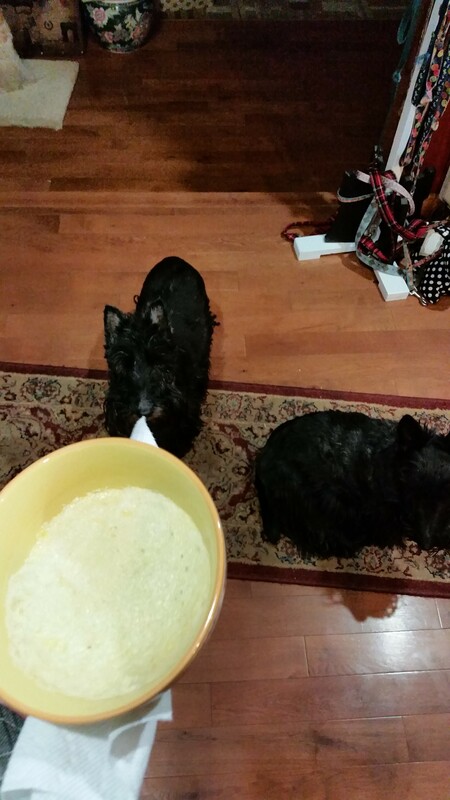 Butter goes together with grits like stubbornness goes with a Scottie. So grits are the one southern dish that me and Ainsley thoroughly enjoy. Catman’s boiled peanuts though? Bleech! Previous Post My last Christmas Present??? So deez grits uxa talks bout..weez heard of dem down here in stralia but never tasted dem….is fey like our Porridge oats ? I don’t know-I can’t get used to them. I’ve never been out of the confines of the old Confederacy myself. Look it up-Arizona was part of the South. Grits? What are grits? Maybe they heard of them down in stralia, but I never did. You ever have shrimp and grits, Sir? Or cheese grits? Nothing like it on a cold winter morn.